Even if the teachers ask higher level questions, student responses to the questions and what they "do" (the task) is what determines the Depth of Knowledge (DOK). DOK 3 can be quick activities, and often times it's just taking the lesson one more step. How does DOK 3 impact reteaching? For reteaching, the teacher should create DOK 3 tasks for students to apply and use their new learning. Often times when students apply their learning, it becomes relevant to them as they make connections to the real world. Does that mean that the teacher skips DOK 1 and 2 levels? No! However, it can not stop at those levels. Reteaching should not be the same lesson or activity done in class, but slower. It should be retaught a different way. That different way should include some time engaging in DOK Level 3 thinking (and perhaps even Level 4). Real World Connections: How is it used in the real world? How could students apply this new learning in the real world? How could they share their learning beyond the four walls of the classroom? How could they impact others with it? DOK 3 Verbs: I think about how the standard would look using DOK 3 verbs. Math Practices: In math, I also think about what the standards would look like in the context of the math practices. DOK 1: It's easy to grade DOK 1 tasks because there are clear correct answers. -- It's either right or wrong. DOK 2: In DOK 2 tasks, there's still a correct answer, however it might not be as easy to grade. 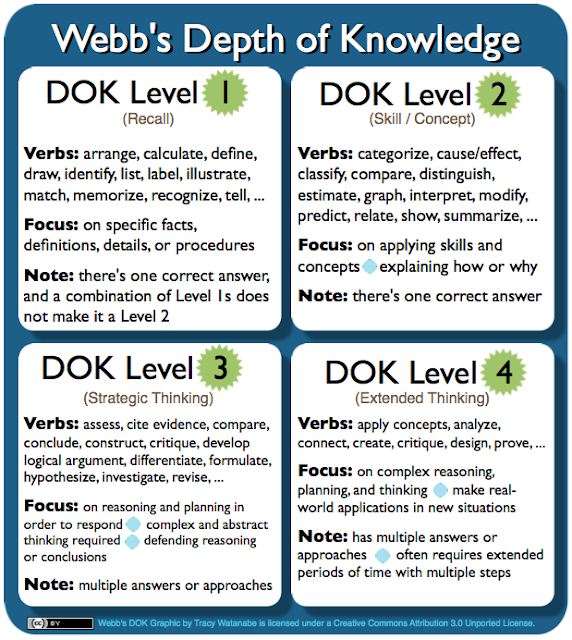 DOK 3 and 4: Use a rubric, or assess students' degree of understanding through various learning facets (eg: consider explanation, interpretation, application, perspective, empathy, and self-knowledge from Wiggins and McTighe's Understanding by Design). 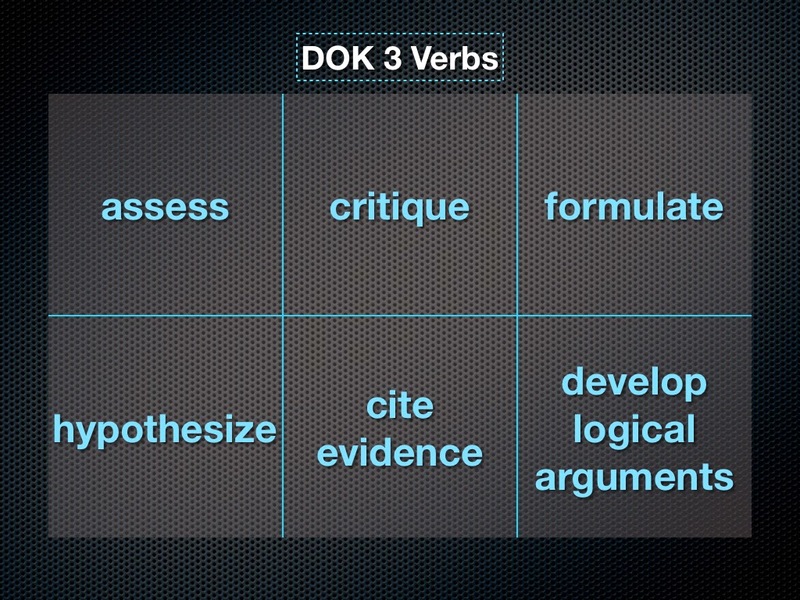 Critique is a DOK 3 verb. 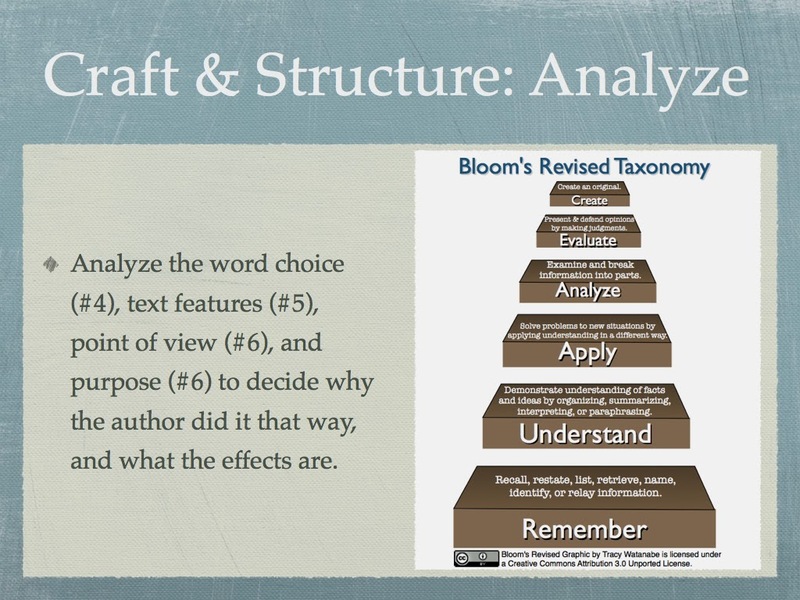 If you are having students critique something, then what's the criteria they are using? Have them establish criteria. 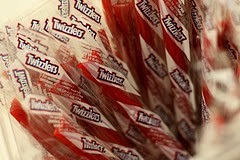 When I taught third grade, I brought in different flavors/types of Twizzlers and asked students which one was better. While they all had their opinions about what they liked, they couldn't critique it without establishing criteria. Students decided that texture (chewiness), presentation (how it looked), sweetness and tanginess, and aftertaste were all considerations. From there, they developed a rating scale (a rubric). Then each student did a taste test and rated the Twizzlers. Individuals critiqued using the criteria. Afterwards, they graphed the data as evidence of their results, and created a group critique based on the data. Students were then able to support their individual opinions with criteria, while also recognizing in the big picture where the majority/minority of opinions were. It was a simple lesson, but from that moment on, they knew the process to create criteria in order to critique something. That process was then applied to various content standards and contexts. Furthermore, it helped establish a class culture for empathizing with differences in opinions and expressing their opinions with justification and evidence to support their claims. DOK 4 tasks are often taking DOK 3 tasks and connecting it to the big picture and doing so regularly over extended time. For instance, if I were to have my students engage in various tasks where they create criteria to critique something, I could ask them to develop generalizations of strategies they use while creating criteria and critiquing. Then ask them to apply those generalizations the next time they develop criteria and critique... and follow up by asking them how they'd revise their generalizations as they try it in new contexts. When students are engaged in DOK 3 and 4 tasks that are worth doing, they are more motivated to learn because it's relevant to them... and classroom management becomes easier because time is spent on teaching/learning rather than behaviors. 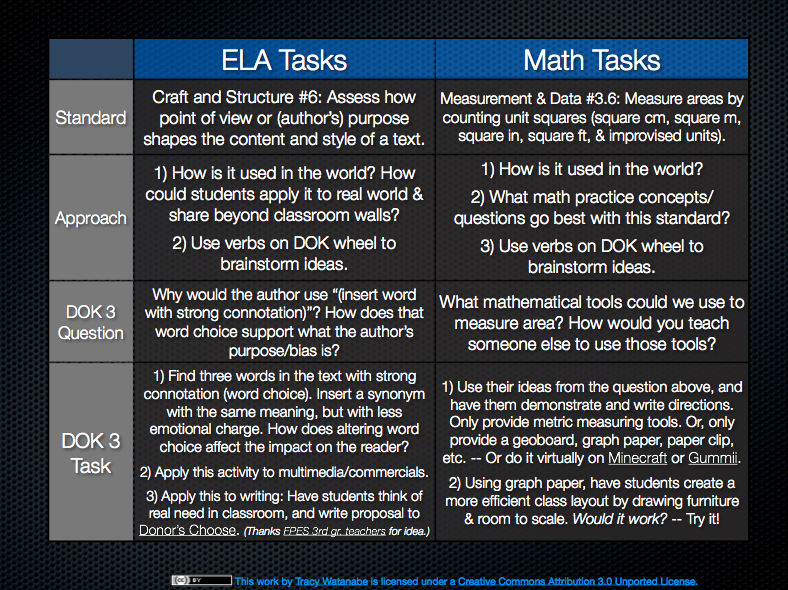 How do you create worthwhile DOK 3 or 4 tasks? How did this post connect with you? What would you add to the discussion?